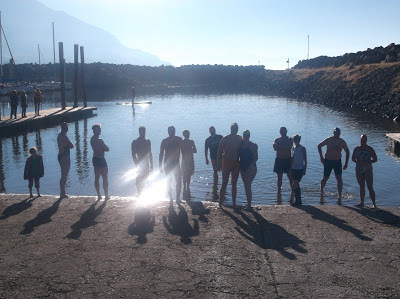 This afternoon was the White Saturday Swim that Gordon organized. I was the last one to get there and was surprised to see a whole bunch of people waiting down on the boat ramp. Goody gave some great safety instructions and then we were off. The water temp was reported to be 50 degrees (but read closer to 48 - 49 once we were out there). My wife, Sabrina, surprised me before we left home by telling me she was going to take the plunge! She was a little hesitant, but ran in, dunked, and ran back out. She is awesome! I was only planning on being in about 15 minutes, but was still feeling good on the way in. I jokingly told Gordon I was going to stay in as long as Jim, thinking it would be another 5 minutes. Little did I know he was planning on staying in for 25. We ended up making it to 31 before we got out. All in all, there were 11 swimmers and plungers. Six new swimmers earned an official Wasatch Front Polar Bear Club cap! There was a bunch of hot chocolate and pie at the top of the ramp for after the swim. It took me a while before I could drink the hot chocolate because my hands were shaking so bad. It was a great time and a fun way to celebrate post-Thanksgiving!